PTT Asahi Chemical Co., Ltd.
On Thursday 10th January 2019, PTTAC in corporation with GC Group, Rayong Government, and Companies in Map Ta Phut Industrail Estate held Garbage Collection caused by “PABUK” tropical strom at Saeng Chan – Suchada Beach, Rayong. There are over 500 volunteers join this event. 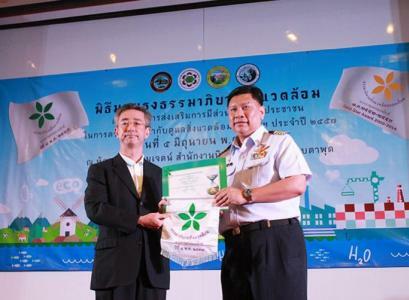 On Monday 25th March 2019, Mr.Hideyuki Shimizu, Plant Director, on behalf on PTTAC has been awarded White Flag-Green Star 2018 : The Project of Enhancement of Public Participation in Safety and Environment Management by Industrial Estate Authority of Thailand (IEAT) which company has been awarded for 7 consecutive years and White Flag-Gold Star for 2 consecutive years also. In this occasion, Ms.Somchint Pilouk, Governor of IEAT presided over the ceremony. 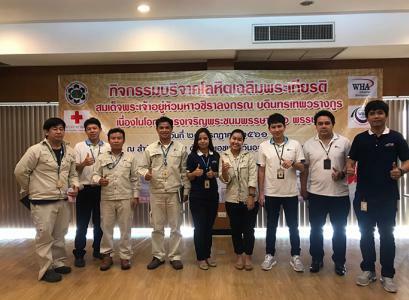 PTTAC volunteers joined “Blood Donation” by WHA Eastern Industrial Estate (Map Ta Phut) on Thursday 21st March 2019. 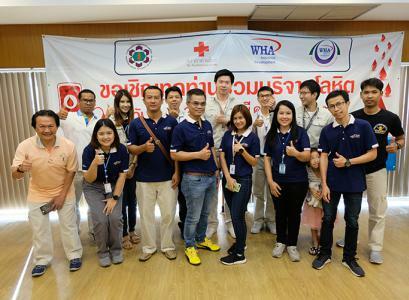 On that day, the blood donation activity had been participated by 190 volunteering employees of PTTAC, Companies in WHA EIE and communities. Total blood collection is 63,450 cc. 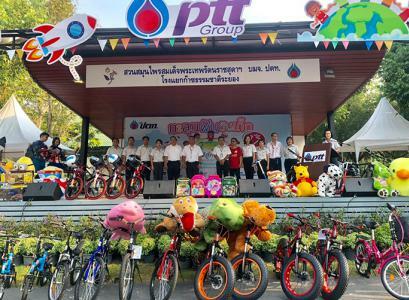 On Saturday 12th January 2019, PTTAC in corporation with PTT Group held National Children Day 2019 at the HRH Princess Maha Chakri Sirindhorn Herb Garden, Rayong for children who resided at Map Ta Phut, Map Kha and Banchang area. PTTAC also arrange “Gachapon” booth. 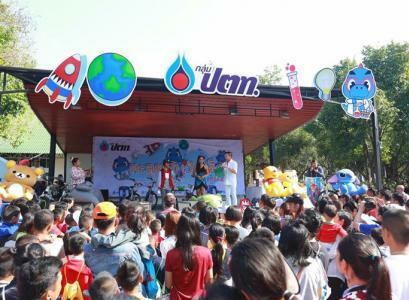 Mr.Koolachart Komonmarn, Division Manager of Corporate Affairs Unit, together with PTT Group management attend the event for give the lucky draw to the children. There are over 19,000 attendees, which is 4,750 children, join this event. In this occasion, CA would like to express our gratitude to all volunteers and internship students that decorated and support at PTTAC Booth Game. 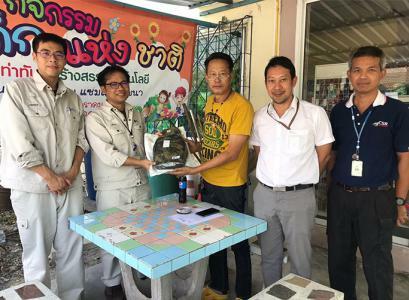 On the occasion of National Children Day 2019, PTTAC delivered gifts to Schools and Communities in Map Ta Phut & Ban Chang area. To let them to be happy in children's event. 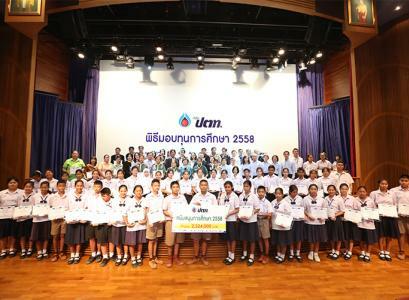 On 8th January 2019, PTTAC together with Golf Club of Map Ta Phut Municipality and Companies in Map Ta Phut Industrial Estate held Scholarship Ceremony for 80 Students in Map Ta Phut Municipality area, 2,000 baht per a student. Also support financial to Map Ta Phut Hospital for medical instruments for 25,000 bah, total 185,000 baht. By the way, scholarship is supported by Charity Golf Event that held in November 2018. On the occasion of the New Year, PTTAC held “Manager Community Visit” for new year greeting to Community Leaders of 31 communities in Map Ta Phut & Ban Chang area since December 2018. Also Mr.Koolachart Komonmarn, Division Manager of Corporate Affairs Unit, together with PTT Group to new year greeting to Management Committee of Rayong Province and Local Government for strengthen good relationships between Government and PTTAC. 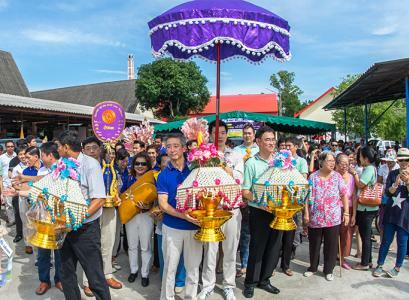 On Thursdays 13th December 2018, Mr.Vitaya Pinmuangngarm, President, with PTTAC Management and Employees joined the Phapa Ceremony 2018 at Mongkhon Samakkhi Thammo Thai Temple (Wat Khao Sap) Temple ,Rayong, that hosted by PTT Global Chemical Public Company Limited (GC). 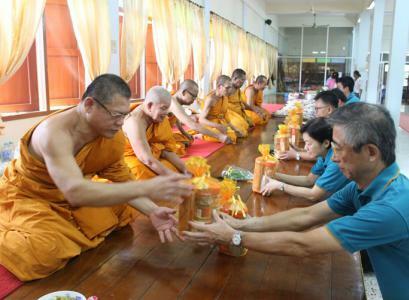 To aims to support the education management of Mongkolwittaya School and Buddhism. 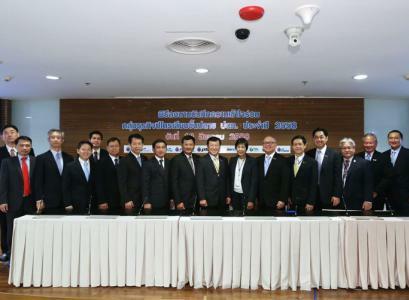 Also PTTAC support 10,000 baht and merit making together with companies in GC group. 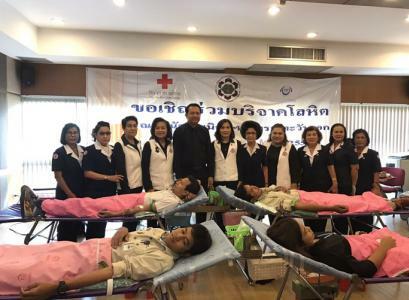 PTTAC volunteers joined “Blood Donation” by WHA Industrial Estate (Map Ta Phut) on Tuesday 11th December 2018. 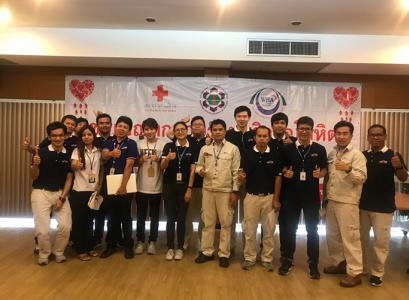 On that day, the blood donation activity had been participated by 120 volunteering employees of PTTAC, Companies in HEIE and communities. Total blood collection is 53,700 cc. 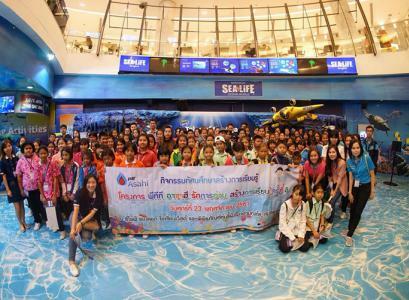 On Friday, 23 November 2018, PTTAC organized Field Trip of 8th PTTAC Reading Lovers Project at SEA LIFE Bangkok Ocean World and Madame Tussauds, Bangkok for students who win the competition from “Reading Stamp Collection Project and Diary of Goodness” instructional materials contest, total 133 persons including teachers from school in Maptaphut Municipality, Ban Chang Municipality and Sub-District Ban Chang Municipality. On this occasion, Mr.Koolachart Komonmarn, Division Manager, Corporate Affairs Unit, project working team and volunteer attend and support the activity. PTTAC host “8th PTTAC Reading Lovers Project Award Ceremony” on Thursday 8th November 2018 at HRH Princess Maha Chakri Sirindhorn Herb Garden. 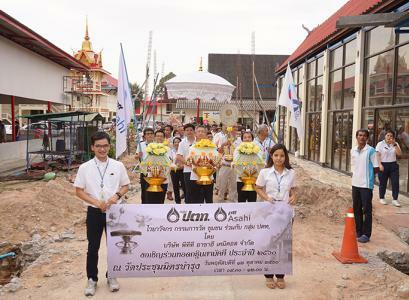 In this occasion, Mr.Vattanaroj Charoenpitaks, Vice President, Corporate presides over the ceremony and also School Directors, Teachers, PTTAC Management and volunteering employees attend the activity. PTTAC deliver the award from Reading Lovers Stamp Collection Project and Diary of Goodness instructional materials contest to 102 students from 17 schools. Also more than 3,200 students joined the project. According to 8th Anniversary of the project, PTTAC also deliver Thai Encyclopedia to 17 schools, total 170,000 baht. PTTAC Reading Lovers Project has been conducting since 2011 and paying high attention from the communities around PTTAC plant. 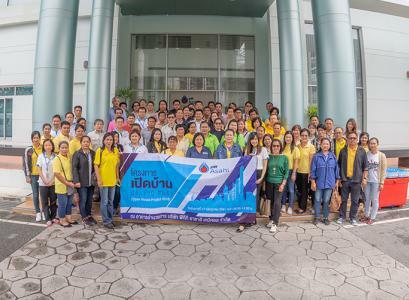 Target, PTTAC aims to encourage students in Maptaphut Municipality, Ban Chang Municipality and Sub-District Ban Chang Municipality to focus in reading, improve the quality of education, and creative in writing which is in line with present educational trends. On 30 – 31 October 2018, Mr.Vitaya Pinmuangngarm, President presided over the PTT Group United Kathin Ceremony 2018 at Nern Kra Prok Temple, Ban Chang Municipality, Rayong. Also joined Allamanda trees planting activity (110 trees) with PTTAC Management & Employees for increase green zone of community area. 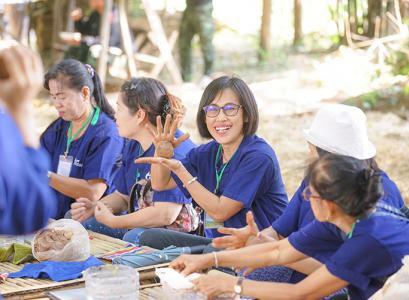 On that day, Government representatives, PTTAC Management and Employees as well as PTT Group Employees, Community leader and member joined the event. In this occasion, CA would like to express our gratitude to all volunteers that together clean up and prepare the area before the ceremony. 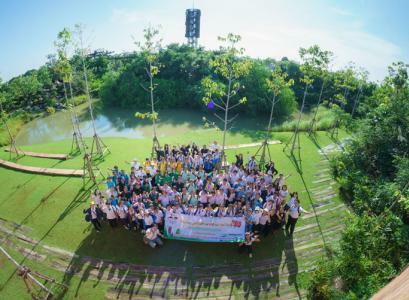 During 5 – 6 October 2018, PTTAC hosted The President Community Visit 2018 for 31 communities from Map Ta Phut, Ban Chang and Ban Chang Sub District Municipality, total 80 persons. The aim of this event is for giving more PTTAC the opportunity to improve our understanding of the community through an exchange of idea and information and help increasing the work relations between community and the Company through workshop activity. In this occasion, Mr.Vitaya Pinmuangngarm, President and Mr.Vattanaroj Charoenpitaks, Vice President, Corporate attend the activityand participated by PTTAC Management, CSR Working Team and Community Coordinator at Lop Buri province , King Narai's Palace and the new theory of agriculture workshop at Wanlapa Farm Stay & Ban Din Moddang, total 36 persons. PTTAC recognizes the importance of internal and external communication in verbal or written form honestly and transparently with appropriate use of channels for each circumstance. So PTTAC has established “Crisis Communication Team (CCT)” for communicate to stakeholders in time of crisis. 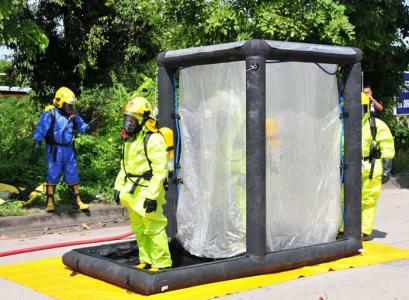 For more knowledge, understanding and expertise to CCT, PTTAC has conducted workshop training by Hill & Knowlton, expert of crisis management, that emergency simulation by chemical leakage. 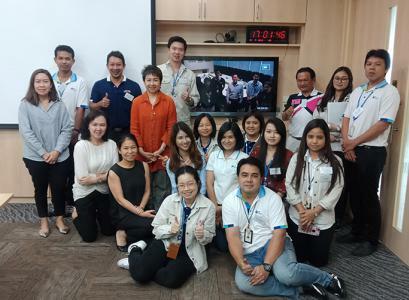 Also especially trained for PTTAC management in course of “media training for spokesperson”, which trainee are consist of Mr.Vitaya Pinmuangngarm, President, Mr.Vattanaroj Charoenpitaks, Vice President Corporate Line, Mr.Yonosuke Ikeda, Vice President Operation Line, and Mr.Hideyuki Shimizu, Plant Director. 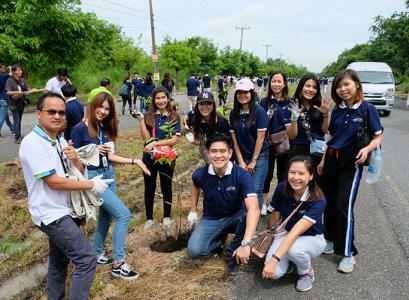 On Wednesday 25th July 2018, PTTAC held “Big Cleaning Activity” at PTTAC plant fence area according to volunteer project “We do good by heart” by Industrial Estate Authority of Thailand (IEAT) and Map Ta Phut Industrial Estate (MTP) for occasion of Ceremony of Greetings to His Majesty the King Rama 10, 66 years old. Therefore, IEAT will record this event to be CSR activity of White Flag – Green Star award 2018. On the auspicious occasion of the 66th birthday anniversary of His Majesty King Maha Vajiralongkorn Bodindradebayavarangkun, PTTAC volunteers joined “Blood Donation” by Hemaraj Eastern Industrial Estate (Map Ta Phut): HEIE on Tuesday 24th July 2018. 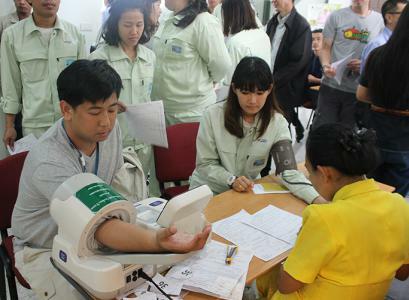 On that day, the blood donation activity had been participated by 200 volunteering employees of PTTAC, Companies in HEIE and communities. Total blood collection is 80,650 cc. On Friday 20th July 2018 at Nernkraprok Temple, PTTAC hosted merit making and scholarship program with Wat Nernkraprok School. 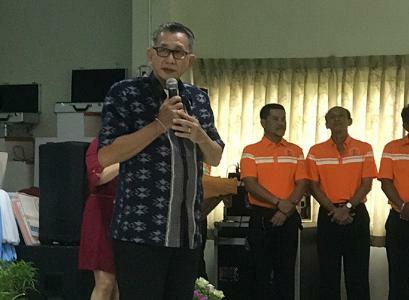 Mr.Vitaya Pinmuangngarm, President presided over the ceremony including PTTAC Management and employees also attended the activity. 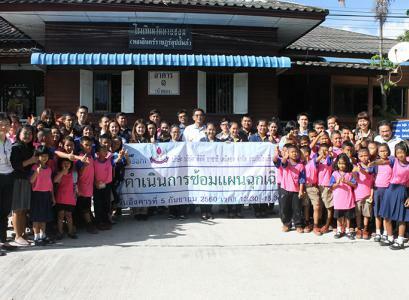 The activity started with merit making and followed by scholarship to students from Wat Nernkraprok School which total 28,000 baht, 10,000 baht by PTTAC and 18,000 baht by employees. The program is an our Company CSR focus through education and its contribution for sustainability in communities around our plant. 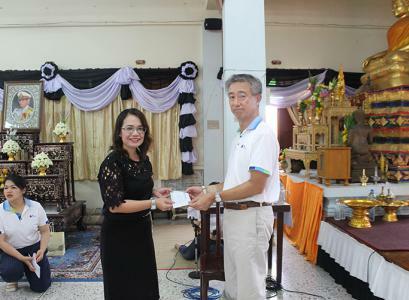 Also PTTAC support financial total 5,000 baht to Child Development Center of Banchang Municipality (Nernkraprok Temple) for develop hygiene of children and plant the trees around temple fence for increase green area of community. On this occasion, PTTAC would like to appreciate all employee who have sponsored the scholarships and participated in this event. 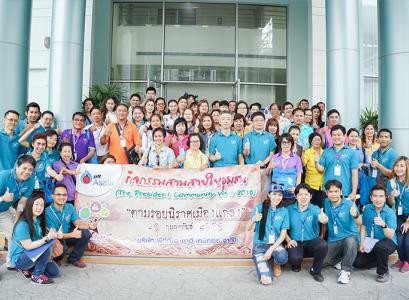 On Tuesday, 17th July 2018 PTTAC hosts “Open House Project 2018” at Rayong Office for neighboring communities total 31 communities and 3 municipalities attendees. In this occasion, Mr.Vitaya Pinmuangngarm, President presides over the event, Managements and employees join and welcome all communities. The activity has been annually held to provide company information such as production, safety, occupational health and environment procedure, CSR activities, emergency communication management including plant visit. The propose is to receive suggestion and build the company's long term corporate interest and public image, including maintain public confidence. On 15th June 2018, PTTAC incorporated with Community of Mapchalude and Mapchalude-Chakklang host emergency response (communication) and evacuation drill. 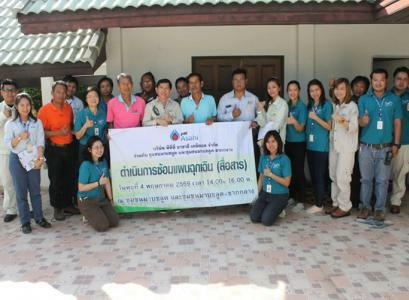 On that day, Safety officer of Map Ta Phut municipality join the activity and advice for the drill. Also on 3rd July 2018, PTTAC incorporated with Wat Mapchalude School host annual emergency simulation and drill 2018 at Wat Mapchalude School. Director of Wat Mapchalude School, Teachers and Students, PTTAC by Mr.Chusak Sinlapasart, Division Manager, Corporate Quality, Security, Safety, Occupational Health and Environment Unit, Mr.Koolachart Komonmarn, Acting Division Manager, Corporate Affairs Unit and volunteering employees attend the activity. Both of activities are included the practices of crisis communication, emergency plan and test for sealing method for assembly rooms. After the drill, all key persons attend wrap-up meeting for conclusion and further plan development. The aim of this drill is to understand the emergency plan and ready for effective emergency response. On 6th June 2018, PTTAC held Kick-off Workshop for discussion on work plan for 8th PTTAC Reading Lovers Project at PTTAC, Rayong office with 17 Schools around our plant, located in Municipality of Map Ta Phut, Ban Chang and Ban Chang Sub-District Municipality area On this occasion, Mr.Koolachart Komonmarn, Acting Division Manager, Corporate Affairs Unit, presided over the activity and gave welcome speech to School Directors and teachers who join the activity. 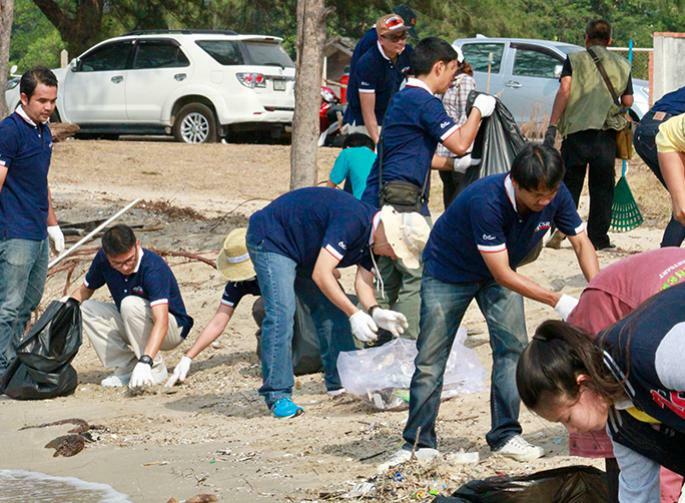 On World Environment Day, Tuesday 5th June 2018, Mr.Vitaya Pinmuangngarm, President of PTTAC coordinated with PTT Group supported financial to Banchang Sub-District Municipality for “Garbage Collection & Tree Planting Activity at Payoon Beach” which the purpose is to protect environmental on the beach, which is consist of landscape improvement activity, garbage collection, and install banner for conservation of natural resources and environment. Also planted 120 Sea Poison trees to increase the abundance of Payoon beach. On this occasion, Mr.Jirasak TapaJot, Banchang District Chief, presides over the ceremony. 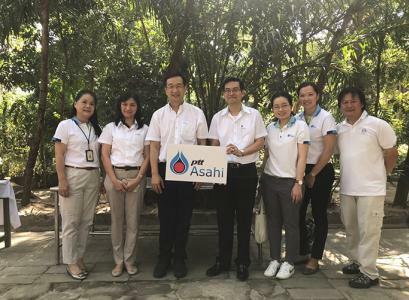 Also PTTAC Management Team, Mr.Hideyuki Shimizu, Mr.Sompoj Kajonpradabkul, Ms.Patcharaporn Petchpradub, Mr.Hiroaki Morita, Ms.Orachorn Suriyo, Mr.Anan Kliangkaew, Mr.Watcharachai Wanthong, Mr.Somkait Kuppatimanus, and Mr.Koolachart Komonmarn with 30 volunteering employees of PTTAC joined the activity on that day. 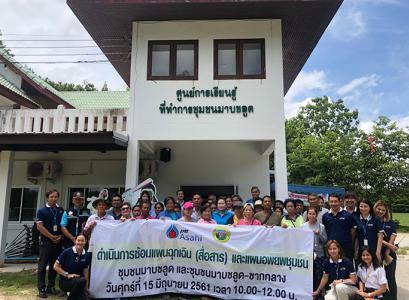 On Wednesday 30th May 2018, PTTAC coordinated with CSR Network, which is consists of 8 companies in Hemaraj Eastern Industrial Estate (Map Ta Phut) (HEIE), held CSR activity “PTTAC Green Day 2018” for knowledge sharing and make firebreak at Community Forest of Ban Phudorn-Huay Mahad which the purpose is to prevent and solve forest fires that may occur in community forest areas. Also planted 100 banana trees for natural firebreak in that areas. On this occasion, Mr.Prapit Yanpanya, Senior Deputy District Chief of Banchang, presides over the ceremony. Also this activity is support network of Neighborhood Company in HEIE for take care and support communities by good CSR activities. 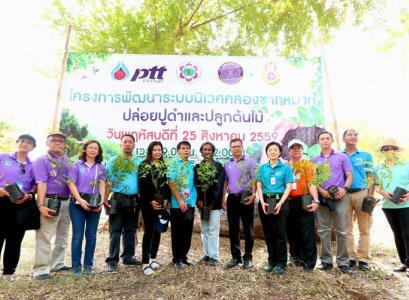 PTTAC joined “Tree Planting Project and Scholarship Ceremony No.7”, hosted by Mapchalude - Chakklang Community, on Friday 25th May 2018 at Rayongwittayakom Nikomuttasahakam School. Project budget is supported by IEAT, Community Market Enterprise, Mapchalude Recycle Enterprise, and Entrepreneurship. Also PTTAC is a company that supported Mapchalude Recycle Enterprise continued throughout. On that day, the host held scholarship ceremony for children in Mapchalude – Chakklang Community for 250 people, each 1,000 baht. Therefore, Mr.Chusak Sinlapasart, Mrs.Nantawan Ingkhaphakorn, and Mr.Koolachart Komonmarn on behalf of PTTAC has been joined this event. 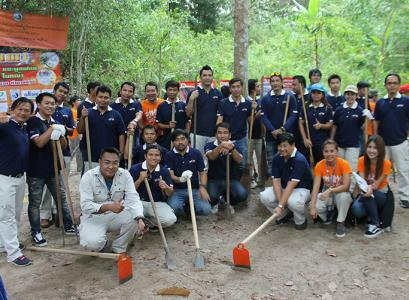 Also 120 volunteering employees of PTTAC joined Mahogany trees planting activity, which is an activity in the project. On Thursday, 22 March 2018, PTTAC volunteers joined “Blood Donation” by Hemaraj Eastern Industrial Estate (Map Ta Phut): HEIE. On that day, the blood donation activity had been participated by 118 volunteering employees of PTTAC, Companies in HEIE and communities. Total blood collection is 52,600 cc. On Saturday, 13 January 2018 PTTAC in corporation with PTT Group held National Children’s Day event 2018 at the HRH Princess Maha Chakri Sirindhorn Herb Garden, Rayong for children who resided at Map Ta Phut, Map Kha and Banchang area. PTTAC also arrange “Basketball Game” booth. On this event Mr.Suchote Singkirat, Acting Department Manager, Procurement Unit, together with PTT Group management attend. There are over 5,100 children join this event. On Thursday 12th October 2017, Mr.Naoki Shibukawa, President presided over the PTT Group United Kathin Ceremony at Prachummit Bamrung Temple, Ban Chang Municipality, Rayong. Joining them were government representatives, PTTAC Management and employees as well as PTT Group employees. Community leader and member, also took part. In this occasion, CA would like to express our gratitude to all volunteers that together clean up and prepare the area before the ceremony. On Tuesday, 5th September 2017, PTTAC incorporated with Wat Mapchalude School host annual emergency simulation and drill year 2017 at Wat Mapchalude School.. Director of Wat Mapchalude School, Teachers and Students, Observers from Neighbor companies, PTTAC by Mr.Chusak Sinlapasart, Division Manager, Corporate Quality, Security, Safety, Occupational Health and Environment Unit, Ms.Aisaelee Thanmikasakul; Division Manager, Corporate Affairs Unit and volunteering employees attend the activity. On that day, the activities are included the practices of crisis communication, emergency plan and test for sealing method for assembly rooms. After the drill, all key persons attend wrap-up meeting for conclusion and further plan development. The aim of this drill is to understand the emergency plan and ready for effective emergency response. On Tuesday 29th August 2017 at Nernkraprok Temple, PTTAC hosted merit making and scholarship award with Wat Nernkraprok School. Mr.Naoki Shibukawa, President presided over the ceremony including PTTAC Management and employees also attended the activity. 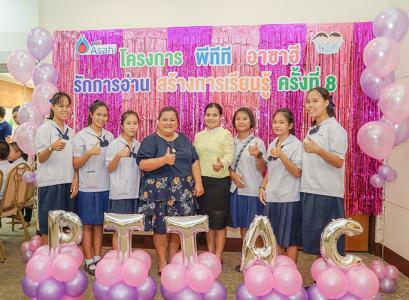 The activity started with merit making and followed by scholarship awarded to student from Wat Nernkraprok School which total 26,000 baht, 10,000 baht by PTTAC and 16,000 baht by employees. The program is an our Company CSR focus through education and its contribution for sustainability in communities around our plant. On Thursday 17 August 2017 at Thai Army Club, Bangkok. PTTAC by Mr.Naoki Shibukawa, the President attend CSR-DIW Award Ceremony 2017. On that day, PTTAC got “CSR-DIW Award” and “Green Industry Award : Level 3 (GI3 : Environmental Management System)” from Department of Industrial Works (DIW), Ministry of Industry by Mrs.Anong Pijitprapaporn, Deputy Director of DIW. Thank you to all volunteers that make the cremation flowers for distribute to people in The Royal Cremation The Late King Rama IX, total 1,300 flowers which is more than the target 1,000 flowers. 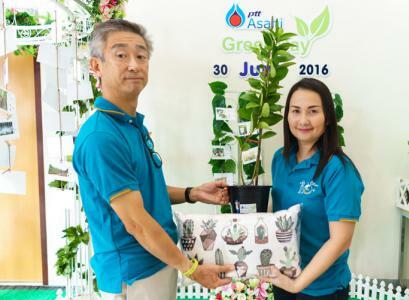 On Monday 7th August 2017, Mr.Naoki Shibukawa, the President of PTTAC, with Mrs.Hongsri Charoenvaravoot, Vice President, Corporate Line and PTTAC Staffs delivered 1,300 cremation flowers to PTT Group Volunteer Club by Mr.Sarun Rungkasiri, Chairman of the club. On Friday 4 August 2017 at Synergy Hall, 6 Fl., EnCo C, PTTAC by Mr.Naoki Shibukawa, the President with Mrs.Hongsri Charoenvaravoot, Vice President, Corporate Line and employees attend PTT Group Grand Opening of Big Cleaning Day 2017. 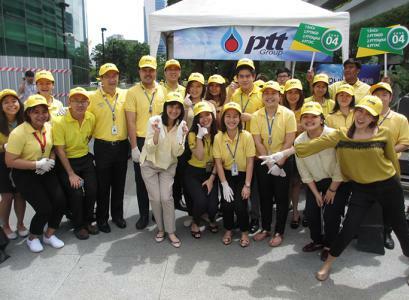 On that day PTTAC Bangkok Office was audited by PTT 5S committee during 13.00 – 15.30 hrs. On Tuesday, 1st August 2017, PTTAC organized the 11th Anniversary of PTTAC Ceremony both Rayong Office and Bangkok Office. At Rayong, The activity was started at 08.30 hrs. PTTAC Management and employees warship Buddha Image and Brahman Shrine at in front of Admin Bldg., then, worship Household God Shrine and Spirit House at Logistics area. 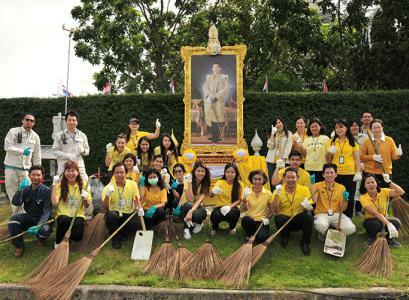 At Bangkok, The activity was started at 09.00 hrs. PTTAC Management and employees warship Brahman Shrine at in front of Energy Complex Bldg. On Tuesday, 25 July 2017, PTTAC volunteers joined “Blood Donation” by Hemaraj Eastern Industrial Estate (Map Ta Phut): HEIE. 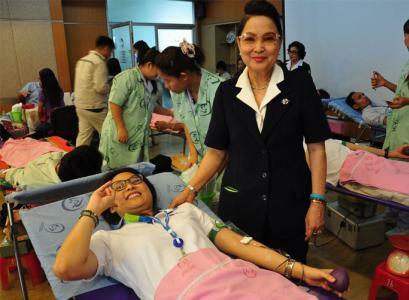 On that day, the blood donation activity had been participated by 134 volunteering employees of PTTAC, Companies in HEIE and communities. Total blood collection is 59,900 cc. 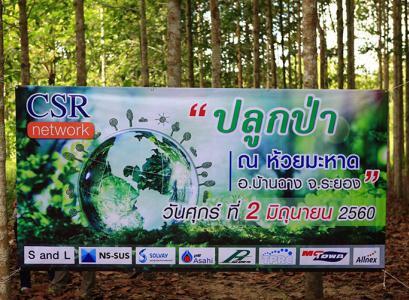 On 2nd June 2017, PTTAC coordinated with CSR Network, which is consists of 8 companies in Hemaraj Eastern Industrial Estate (Map Ta Phut) (HEIE), held CSR activity “PTTAC Green Day 2017” at Community Forest of Ban Phudorn-Huay Mahad which the purpose is to improve the green area in communities by plant 800 trees, weeds removal and garbage collection. On this occasion, Mr.Suchin Pulhirun, Mayor of Banchang Sub-district Municipality, presides over the ceremony. Also this activity is support network of Neighborhood Company in HEIE for take care and support communities by good CSR activities. On 31st May 2017, PTTAC held Kick-off Workshop for discussion on work plan for 7th PTTAC Reading Lovers Project at PTTAC, Rayong office with 17 Schools around our plant, located in Municipality of Map Ta Phut, Ban Chang and Ban Chang Sub-District Municipality area. On this occasion, Ms.Aisaelee Thanmikasakul; Division Manager, Corporate Affairs Unit, presided over the activity and gave welcome speech to School Directors and teachers who join the activity. 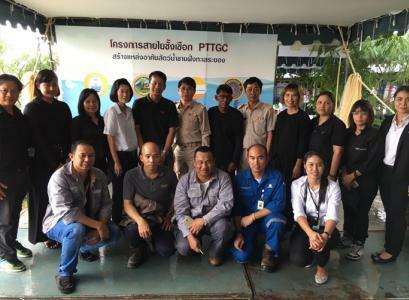 On Tuesday, 21st February 2017, PTTAC incorporated with Rayong Hospital held Workshop for Toxicological and Hazmat Life Support for Healthcare Professionals. 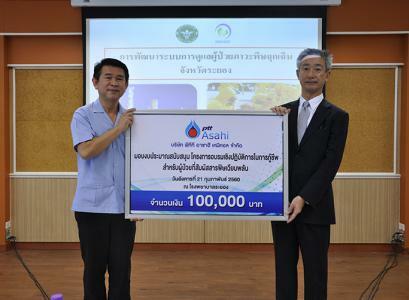 PTTAC by Mr.Naoki Shibukawa, President, to support the financial amount 100,000 baht to Mr.Witoon Danwibool, Director of Rayong Hospital and employees of Corporate Quality, Security, Safety, Occupational Health and Environment Unit attend the activity. объемные буквы цена On this event, Ms.Aisaelee ThOn Saturday, 14 January 2017 PTTAC in corporation with PTT Group held National Children’s Day event 2017 at the HRH Princess Maha Chakri Sirindhorn Herb Garden, Rayong for children who resided at Map Ta Phut, Map Kha and Banchang area. PTTAC also arrange “Egg Scoop Game” booth. 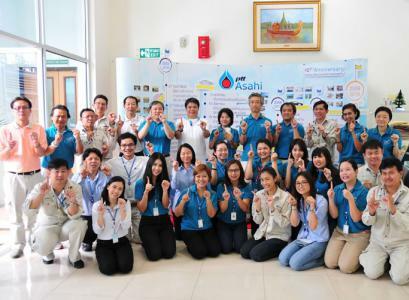 anmiksakul, Division Manager, Corporate Affairs Unit together with PTT Group management attend. There are over 5,800 children join this event. On Wednesday, 14th December 2016, 13.30 hrs. at Auditorium Hall of PTT Global Chemical Public Company Limited, PTTAC in cooperation with PTT Group host 2016 PTT Group Annual Scholarship Award Ceremony. Mr.Surasak Charoensirichot, Rayong Governor preside over the ceremony. In this occasion, Ms.Aisaelee Thanmiksakul, Division Manager, Corporate Affairs Unit, is pleased to obtain the scholarship award to the student and attended by honored guests from PTT Group Managements, representative from government sectors, teachers and students, PTT group employees and Medias from various channels. 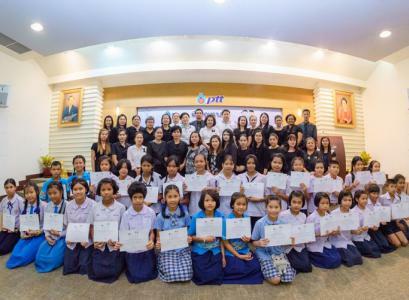 PTT Group Annual Scholarship Award Ceremony is yearly project of its ongoing Corporate Social Responsibility (CSR) initiatives for supporting all education levels in Rayong area for this year 2016, PTT Group has supporting to school project total of 20 funds. High school level 18 funds. And continued education support 108 funds. The total scholarship is worth 2,378,000 THB for this year. On Tuesday, 6 December 2016, PTTAC volunteers joined “Blood Donation” by Hemaraj Eastern Industrial Estate (Map Ta Phut): HEIE. 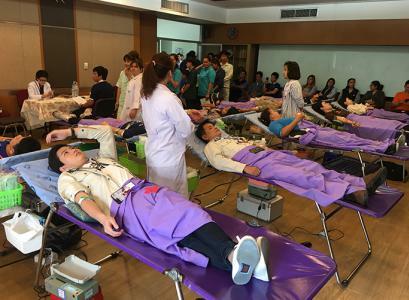 On that day, the blood donation activity had been participated by 108 volunteering employees of PTTAC, Companies in HEIE and communities. Total blood collection is 47,800 cc. 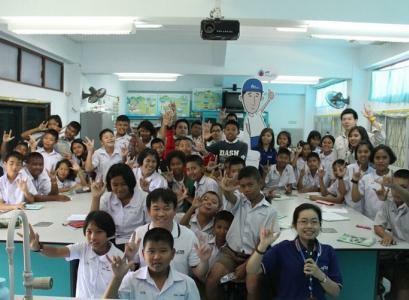 On Friday, 25 November 2016, PTTAC organized field trip of PTTAC Reading Lovers Project at PTT Green in the City and Bangkok Planetarium for students who win the competition from Reading Stamp Collection Project and “Rayong is my hometown” instructional materials contest, total 118 persons including teachers from school in Maptaphut Municipality, Ban Chang Municipality and Sub-District Ban Chang Municipality. On this occasion, there are project working team and volunteer attend and support the activity. Vice President, Corporate presides over the ceremony and also School Directors, Teachers, PTTAC Management and volunteering employees attend the activity. 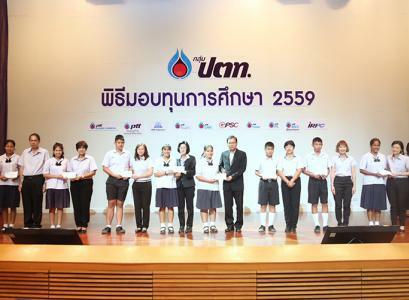 PTTAC deliver the award from Reading Lovers Stamp Collection Project and “Rayong is my hometown” instructional materials contest to 96 students from 16 schools. PTTAC Reading Lovers Project has been conducting since 2011 and paying high attention from the communities around PTTAC plant. Target, PTTAC aims to encourage students in Maptaphut Municipality, Ban Chang Municipality and Sub-District Ban Chang Municipality to focus in reading, improve the quality of education, and creative in writing which is in line with present educational trends. On Friday 4th November 2016, Mr.Naoki Shibukawa, President presided over the PTT Group United Kathin Ceremony at Nern Kraprok Temple, Ban Chang Municipality, Rayong. Joining them were government representatives, PTTAC Management and employees as well as PTT Group employees. More than 200 Buddhist devotees, both community leader and member, also took part. In this occasion, CA would like to express our gratitude to all volunteers that together clean up and prepare the area before the ceremony. The United Kathin by PTTAC aims to preserve Thai cultural heritage and has been conducted annually since year 2009. PTTAC together with Srithai Enterprise Company Limited conducted emergency simulation and drill of AN leakage during transportation by truck on Friday, 28th October 2016 at 10.00 – 12.00 hrs. at near Poonchai Community Office, Nakorn Rayong 75 Road., Rayong. 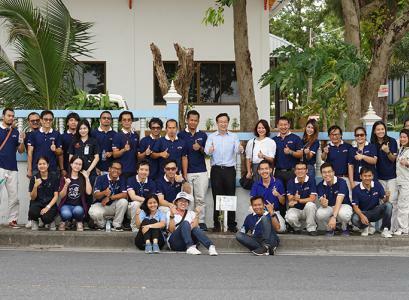 On Thursday, 28th July 2016, PTTAC leading by Mr.Naoki Shibukawa; President, Mrs.Hongsri Charoenvaravoot; Vice President, Corporate Line, Mr.Naoki Sugiyama; Vice President, Operation Line together with management and volunteering employees entertain and support lunch for special need children at Rayong Special Education Center. 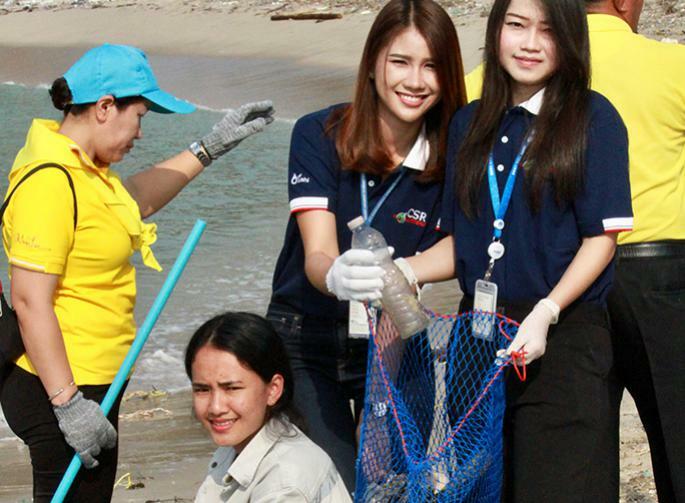 On Thursday, 25th August 2016 PTTAC together with PTT Group, Map Ta Phut Industrial Port, Industrial Estate Authority of Thailand, Department of Fisheries, Pramong Ruea Lek Ta Gwan – Aow Pra Doo fishery group and Maptaputphanpittayakarn School held Ecosystem Development project of Chark-Mark canal 2016 to develop an ecosystem around the canal in order to be a natural learning center. Activities are consist of; 150 Cassia trees and Neem Trees planting, 1,000 little crabs releasing and garbage collection at the beach. 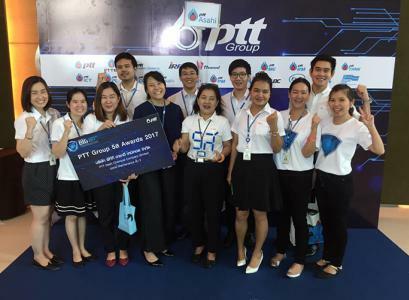 On Thursday, 28th July 2016, PTTAC organized the ceremony of 10th Anniversary of PTTAC both Rayong and Bangkok Office for the auspicious occasion of the ceremony. At Rayong, The activity was started at 07.00 hrs. PTTAC Management and employees merit making at RYA2. at 07.50 warship Brahman Shrine at in front of Admin Bldg., followed by worship Household God Shrine and Spirit House at Logistics area. At Bangkok, The activity was started at 09.00 hrs. PTTAC Management and employees warship Brahman Shrine at in front of Energy Complex Bldg. On Tuesday, 26 July 2016, PTTAC volunteers joined “Blood Donation” by Hemaraj Eastern Industrial Estate (Map Ta Phut): HEIE. 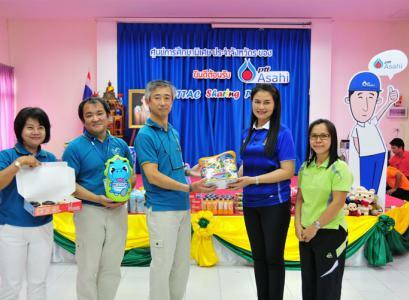 On that day, the blood donation activity had been participated by 135 volunteering employees of PTTAC, Companies in HEIE and communities. Total blood collection is 59,750 cc. 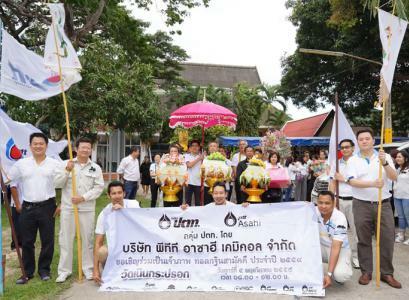 PTTAC Management present vase of flowers and sign well-wishing books for auspicious occasion of 70th Anniversary of His Majesty the King's Accession to the Throne. On Friday, 15 July 2016, PTTAC Management leading by Mr.Naoki Shibukawa, President, present vase of flowers and sign well-wishing books in front of the King's portrait at the Sahathai Samakom Pavilion inside the Grand Palace for auspicious occasion of 70th Anniversary of His Majesty the King's Accession to the Throne. On Tuesday, 12th July 2016 at Nernkraprok Temple, PTTAC hosted merit making and scholarship award with Wat Nernkraprok School. Mr.Naoki Shibukawa, President presided over the ceremony including PTTAC Management and employees also attended the activity. The activity started with merit making and followed by scholarship awarded 10,000 baht to student from Wat Nernkraprok School. The program is an our Company CSR focus through education and its contribution for sustainability in communities around our plant. On 30th June 2016, PTTAC held CSR activity “PTTAC Green Day 2016” at North and East side of PTTAC Plant which the purpose is to improve the green area around our plant and the communities by weeds removal and garbage collection together with growth observation in order to be reference of growth trends in the near future. On this occasion, Mr.Naoki Shibukawa, President presided over the ceremony and award to winner of Slogan and Photo Contest in theme “Green Day”, PTTAC management and 93 volunteering employees also joined the activity. On Tuesday, 28th June 2015, PTTAC incorporated with Wat Mapchalude School host annual emergency simulation and drill year 2016 at Wat Mapchalude School. 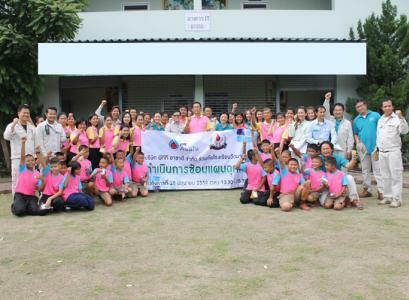 Wat Mapchalude School Director, Teachers and Students, Observers from Mapchalude community and Office of Disaster Prevention and Mitigation, Map Ta Phut Municipality, PTTAC by management and volunteering employees attend the activity. On that day, the activities are included the practices of crisis communication, emergency plan and test for new sealing method for assembly rooms. After the drill, all key persons attend wrap-up meeting for conclusion and further plan development. The aim of this drill is to understand the emergency plan and ready for effective emergency response. 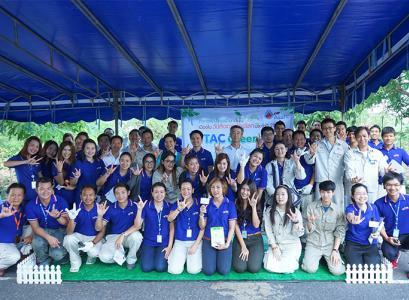 On Friday, 10 June 2016, Corporate Quality, Security, Safety, Occupational Health and Environment Unit hosts “PTTAC Big Cleaning Day 2016” at PTTAC, Rayong office. In this occasion Mr. Naoki Sugiyama, PTTAC Vice President, Operation presides over the ceremony. 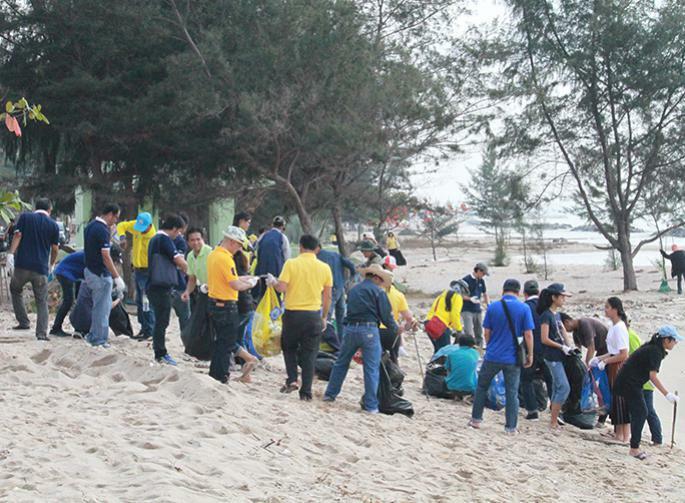 On that day, Management, Employees and Contractors also help together to clean up the process area. Mr. Wichian Chaiyabang, Lamplaimat School’s Principal signed the MOU at Srisontorn 2 room, Star Hotel Rayong. On this occasion, Mrs.Hongsri Charoenvaravoot, Vice President, Corporate Line attended the ceremony. PTT Group has collaborated with Lamplaimat School (Buriram), Educational Service Area Office and 20 schools in Maptaphut municipality, Banchang District municipality, Banchang Sub-District municipality and Mabkha Pattana municipality to conduct “21st Century Schools Project” in order to develop the schools on learning and environment management as well as teacher development on teaching process. Furthermore, to strengthen the students with the knowledge, skills and attributes that be required in the 21st century (AD 2001-2100), the students should live and work in their own area firmly with "Good" and "Smart" that will be keys to build a strong community and sustainable network with PTT Group in the future. 21st Century School Project by PTT Group consists of 2 main events; “21st Century School“ and “The Coacher"
On Wednesday, 4 May 2016, PTTAC incorporated with Mapchalude and Mapchalude – Chark Klang Community host Emergency Drill (Communication) year 2016. Community leaders and community committee, Observers from MC-Towa International Sweeteners. Co.,Ltd., S and L Specialty Polymers Co.,Ltd. and Siam Mitsui PTA Co.,Ltd. 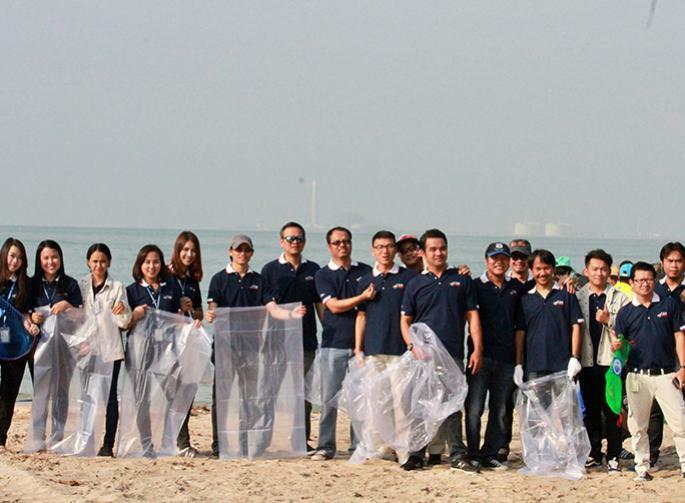 PTTAC by management together with volunteering employees attend the activity. After the drill, all key persons attend close and wrap-up meeting for conclusion and further plan development. The aim of this drill is to understand the emergency plan and ready for effective emergency response. 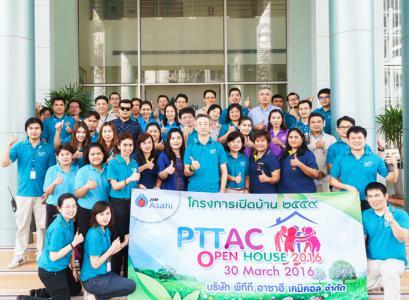 PTTAC hosts “PTTAC Open House 2016” at Rayong Office for neighboring schools total 12 school attendees. In this occasion, Mr.Naoki Shibukawa, President presides over the event, Managements and employees join and welcome all schools. The activities have been annually held to provide company information such as production, safety, occupational health and environment procedure, CSR activities, emergency communication management including plant visit. The propose is to receive suggestion and build the company's long term corporate interest and public image, including maintain public confidence. 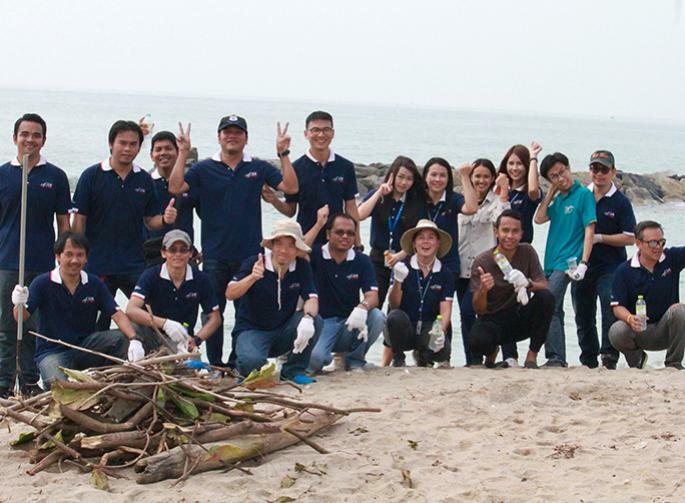 Volunteers by PTTAC participate the Aquatic Animal Releasing Project 2016 arranged by PTT Group at Suan Son beach, Rayong in order to establish the ecological balance and help increasing income for community. Crabs and spotted babylons were released. 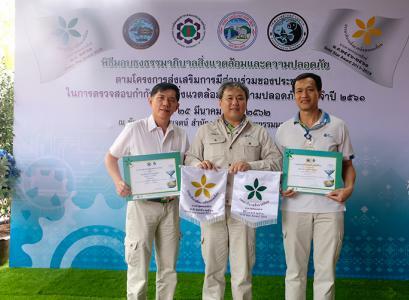 Friday, 18 March 2016 at Map Ta Phut Industrial Estate Office, PTTAC has been awarded White Flag-Green Star 2015 : The Project of Enhancement of Public Participation in Safety and Environment Management by Industrial Estate Authority of Thailand (IEAT) which company has been awarded for 4 consecutive years. IEAT has set up the audit committee which consists of management of academic institutes, community leaders, and local government organizations. The 5 audit key criteria are comprised of 1. Water 2. Waste/Soil waste 3. Air quality/Noise 4. Green area and working condition 5. Community quality of life supporting. The committee assessed the industries in accordance with specified evaluation form. The good governance flags have been given to the industries that passed evaluation standard only. In this occasion, Mr. Verapong Chaiperm, Governor of IEAT presided over the ceremony. 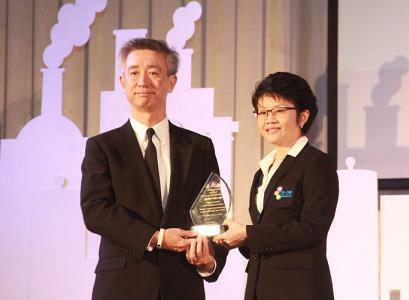 Mr.Naoki Shibukawa, PTTAC President has received the award. On Friday 19th February 2016, PTTAC hosted President Community Visit 2016 in rally format “Journey to Muang Klaeng” for communities from Mapthaput, Ban Chang and Ban Chang Sub District Municipality. The aim of this event is for giving more PTTAC the opportunity to improve our understanding of the community through an exchange of idea and information and help increasing the work relations between community and the Company through team-building activity. "The child is father of the man who has grown to be a major force in the development of the country”. Education is the learning basis of youth, PTTAC has recognized the importance of education that is a part of PTTAC Sustainability Management policy. Company has implemented “Happy Class Project” to educate and prepare the O-Net (Ordinary National Educational Test) to students grade 6 of Wat Mapchalude School in mathematics and science during 27th January - 18th February 2016. 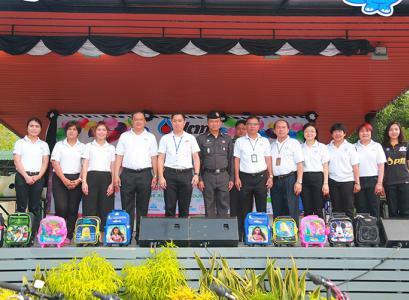 On Saturday, 9 January 2016 PTTAC in corporation with PTT Group held National Children’s Day event 2016 at the HRH Princess Maha Chakri Sirindhorn Herb Garden, Rayong for children who resided at Map Ta Phut, Map Kha and Banchang area. 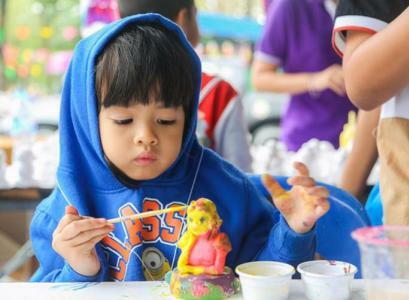 PTTAC also arrange an Art booth “Painting, Gel Candle, Paper Models and Balloons darts game”. On Wednesday, 25th November 2015 09.00 hrs at Auditorium Hall of PTT Global Chemical Public Company Limited, PTTAC in cooperation with PTT Group host 2015 PTT Group Annual Scholarship Award Ceremony. Mr.Montree Chaichanawiboonwat, Rayong Vice Governor preside over the ceremony. In this occasion, Mrs. Hongsri Charoenvaravoot, Vice President Corporate, is pleased to obtain the scholarship award to the student and attended by honored guests from PTT Group Managements, representative from government sectors, teachers and students, PTT group employees and Medias from various channels. 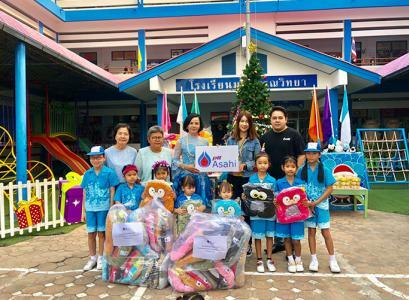 PTT Group Annual Scholarship Award Ceremony is yearly project of its ongoing Corporate Social Responsibility (CSR) initiatives for supporting all education levels in Rayong area for this year 2015, PTT Group has supporting to school project total of 20 funds. High school level 18 funds. And continued education support 90 funds. The total scholarship is worth 2,324,000 THB for this year. 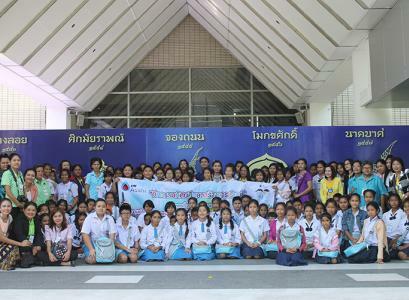 On Wednesday, 25 November 2015, PTTAC organized field trip of PTTAC Reading Lovers Project No.5 at Art in Paradise (interactive art museum) and Thailand Cultural Center (Royal Khon Performance, Prommas) for students who win the competition from Reading Stamp Collection Project and Poetry Contest, total 113 persons including teachers from school in Maptaphut Municipality, Ban Chang Municipality and Sub-District Ban Chang Municipality.On this occasion, there are project working team and volunteer attend and support the activity. 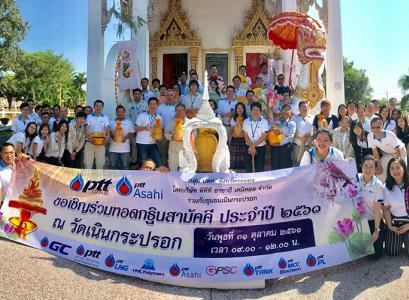 On Friday 6th November 2015, PTTAC and PTT MCC Biochem arranged the PTT Group United Kathin Ceremony at Prachummitr Bumroong Temple, Ban Chang Municipality, Rayong. Joining them were government representatives, PTTAC Management and employees as well as PTT Group employees. 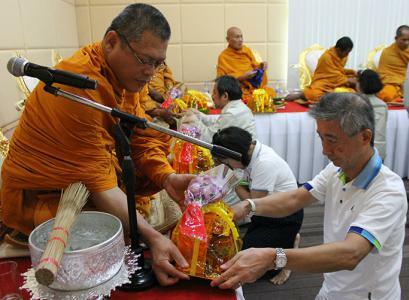 More than 200 Buddhist devotees, both community leader and member, also took part. 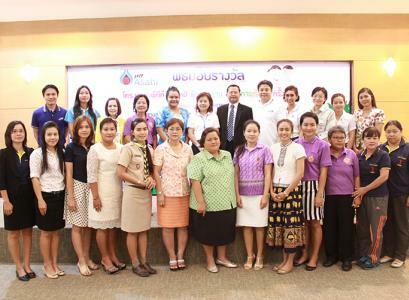 PTTAC host “5th PTTAC Reading Lovers Project Award Ceremony” on Wednesday, 4th November 2015 at HRH Princess Maha Chakri Sirindhorn Herb Garden. PTTAC deliver the award from Reading Lovers Stamp Collection Project and “Reading Lovers” Poetry contest to 96 students from 16 schools. PTTAC Reading Lovers Project has been conducting since 2011 and paying high attention from the communities around PTTAC plant. Target, PTTAC aims to encourage students in Maptaphut Municipality, Ban Chang Municipality and Sub-District Ban Chang Municipality to focus in reading, improve the quality of education, and creative in writing which is in line with present educational trends. On Saturday, 22 August 2015, PTTAC incorporated with Maptaphut Municipality and CPA conduct Emergency (Communication) Level 3 and Evacuation Drill 2015 with Mapchalude and Mapchalude-Chack Klang Community. There are 96 attendees and observers. The aim of this drill is to understand the emergency communication plan and ready for effective emergency response. After the drill, all key persons attend close and wrap-up meeting for conclusion and further plan development. On Tuesday 18th August 2015, Mr. Naoki Shibukawa, President signed MOU of PTT Group Green Packaging; PTT Group cooperation on reducing greenhouse gas emissions strategy from packaging. 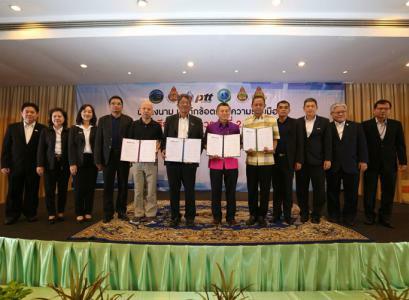 The MOU is appended in Signing Ceremony of Downstream Petroleum Business Group 2015 at Spirit room, 13th Fl., PTT Headquarter in order to express strong business intention on creating energy security along with corporate social responsibility, including commitment of sustainable PTT Group logistics management. 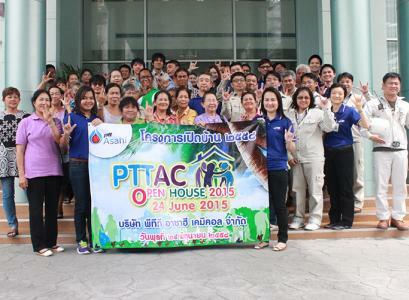 On Wednesday, 24 June 2015 PTTAC hosts “PTTAC Open House 2015” at Rayong Office for communities around our plant (Mapchalude and Mapchalude Chakklang), neighboring companies (MC Towa International Sweeteners Co., Ltd. And S and L Specialty Polymers Co., Ltd.) and Hemaraj Eastern Industrial Estate (Map Ta Phut) total 29 attendees. 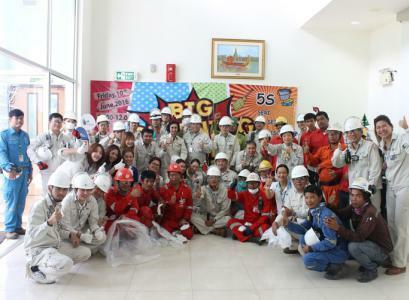 The activities have been annually held to provide company information such as production, safety, occupational health and environment procedure, CSR activities, emergency communication management including plant visit. The propose is to receive suggestion and build the company's long term corporate interest and public image, including maintain public confidence. On Tuesday, 16th June 2015, PTTAC incorporated with Wat Mapchalude School host annual emergency simulation and drill year 2015 at Wat Mapchalude School. 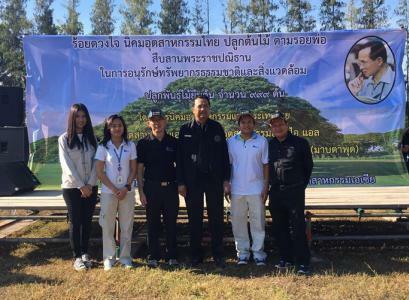 Wat Mapchalude School Director, Teachers and Students, Observers from Mapchalude community and Office of Disaster Prevention and Mitigation, Map Ta Phut Municipality, PTTAC Management and volunteering employees attend the activity. On that day, the activities are included the practices of crisis communication, emergency plan and test for new sealing method for assembly rooms. After the drill, all key persons attend wrap-up meeting for conclusion and further plan development. The aim of this drill is to understand the emergency plan and ready for effective emergency response. 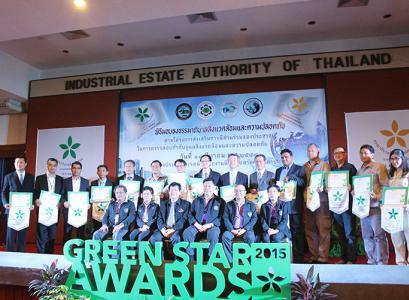 On Friday, 5 June 2015 at Map Ta Phut Industrial Estate Office, PTTAC has been awarded White Flag-Green Star 2014 : The Project of Enhancement of Public Participation in Safety and Environment Management by Industrial Estate Authority of Thailand (IEAT) which company has been awarded for 3 consecutive years. IEAT has set up the audit committee which consists of management of academic institutes, community leaders, and local government organizations. The 5 audit key criteria are comprised of 1. Water 2. Waste/Soil waste 3. Air quality/Noise 4. Green area and working condition 5. Community quality of life supporting. The committee assessed the industries in accordance with specified evaluation form. The good governance flags have been given to the industries that passed evaluation standard only. 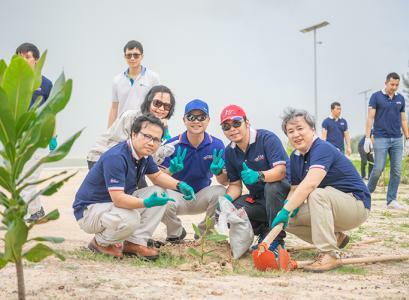 On 5 June 2015, ”PTTAC held CSR activity PTTAC Green Day 2015” at East side of PTTAC Plant which the purpose is to improve the green area around our plant and the communities by reforestation, weeds removal and garbage collection together with growth observation in order to be reference of growth trends in the near future. On this occasion, Mr.Naoki Shibukawa, President presided over the ceremony and join tree planting activity. 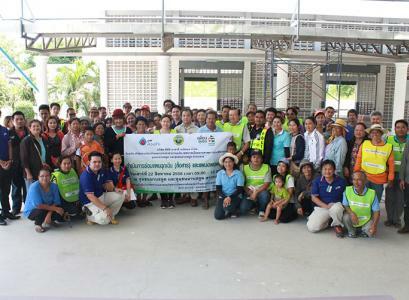 PTTAC management and 60 volunteering employees also joined the activity. 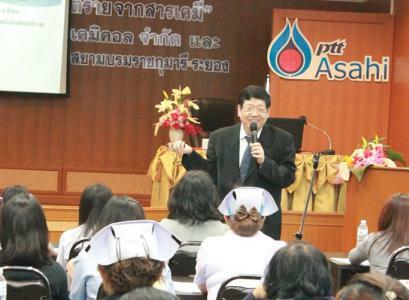 On Thursday, 29 January 2015, the training course “Medical toxicology & treatment guideline for patients who have been exposed to toxic substance” is jointly organized by PTTAC and Maptaphut Hospital. 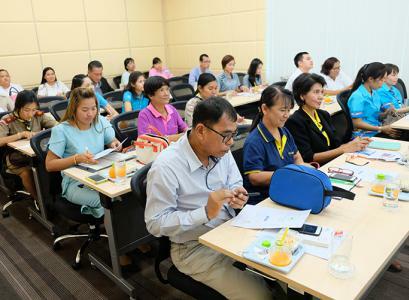 The courses are taught by the expert, Prof. Winai Wananukul, M.D., Head of Clinical Pharmacology and Toxicology Department, Faculty of Medicine Ramathibodi Hospital, Mahidol University. Some 90 medical members attended the course.